Question: should I write a book or not? Someone recently messaged me to encourage me to publish a book of low-resource ideas for initial language teacher training. I think I would like to write such a book (when I get the time, that is! ), but I would hate to do it if the world doesn’t seem to want something like that with the Teacher Training Unplugged twist. So here is a bit of fun with a serious purpose: if you have a moment, please answer this simple question and I promise I’ll act (sooner or later) on the results! If you can’t see the poll question, it is because your browser is blocking the embedded content from PollDaddy – this could happen if you use Ghostery or NoScript to protect yourself online. Please allow PollDaddy if you want to see and answer the question. Thanks for participating; I’m really looking forward to what you think. I didn’t take your poll because I’m not a teacher-trainer in the manner you mean. I have student teachers who come to my classroom for one day a week but not a class of student teachers.I also don’t teach in a language school. Nevertheless in my opinion you SHOULD write a book (well , an ebook is cheaper to buy!). 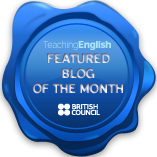 The great thing about your blog, which would be the same in your book, is that you raise issues one ought to ponder on when working with “fledgling” teachers and lots of teachers don’t read blogs. but they might look for reading material when they begin training. While I suppose it might be mainly of interest to TTs, I’ve been thinking about how to make it more accessible than that. I’ve recently moved into teacher training and am a bit lost. It has to be unplugged as I have no resources, even OHP and the teachers/courses are being unplugged too. Because of all this I would LOVE a handbook/guide/idea book based on your wealth of ideas to help me plan loose TT sessions. This would be very helpful for people like me and give us the confidence we need and also show to our bosses tat we aren’t just plucking ideas from the air. Being a book about unplugging and teaching materials-light though is the real challenge. A traditional format may not be suitable as you want to convey ideas or the sources of ideas with possible frameworks. This is the eternal struggle. On the other side, an essential guide for new teachers would be good too, one for those about to or doing the CELTA or even a post-CELTA book. The possibilities seem endless but whatever you do I’m sure I speak for everyone here in that we are behind you. Maybe a few thousand geographical miles but still behind you or in front of you, it depends…you get the drift! Thanks Phil – really appreciate the vote of confidence. Yes, yes, yes! I’m not a teacher trainer but I would still read it. Thanks Barry – really appreciate the positive feedback! Actually toying with the idea (if I do it at all) of not charging but asking for donations to Teachers Without Borders. What do you think? I would have to not only take out my wallet, but also rearrange my budget for the month. Seriously, it’s a great idea. But I also think you should get paid for your ideas. The gift you’ve given to the ELT community with this site is great, but making a little bit of money off of your hard work isn’t such a bad thing.